After a seven month hiatus DML has now completed its early production German eight-wheel heavy armored car series with the base model Sd. Kfz. 231 variant. Essentially it is the preceding Sd.Kfz. 232 model less the antenna mount and fittings. Over 600 of these vehicles were built and used in all theaters of operations during WWII. 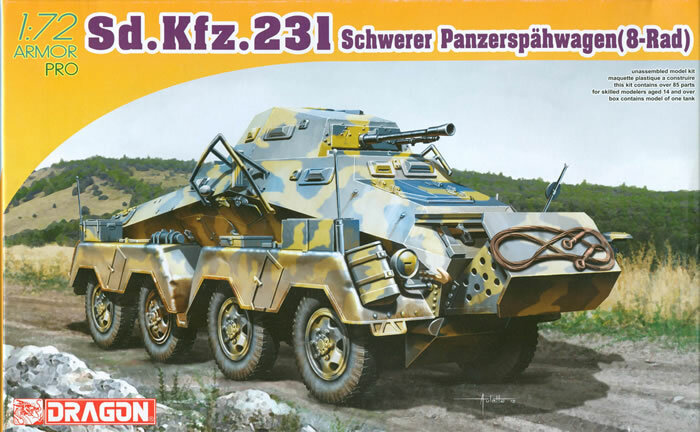 Popular and effective, they did have some failings such as being top-heavy and this was addressed in the follow-on Sd.Kfz. 234 series. As before, this kit is all styrene - no etched brass or DS Plastic is provided. The kit produces a model with its forward standoff armor/stowage bin, two jerry cans, and a spare tire provided in the kit. The directions - considering by DML standards this is a “simple” kit - are STILL confusing at best. In Step 1 it shows the two wheel bogie assemblies (two axles assembled together) as “optional” parts! (I suspect they meant “either/or” but it is unclear due to the monkey-see-monkey-do symbols.) It would appear that parts A6-B21-A7 make up one bogie and A8-B31-A9 the second one. They should mount with the A6 bogie in the front with the drive end of B21 towards the center and A8 in the rear with the drive end of B31 also facing the middle. Step 5 now only shows the option of fitting the spare tire over the air grille. Five finishing options are shown: 2st SS Motorized Division “Das Reich”, Yugoslavia 1941 (grey with black/white crosses, reg number SS-5931); 1st SS Motorized Division “LAH”, Greece 1941 (grey with black/white crosses, no reg number); 23rd Panzer Division, Mozdok 1942 (sand over grey with no reg number); 2nd SS Panzer Division “Das Reich”, Kursk 1943 (sand overall with black/white crosses, reg number SS-152276), and Aufkl.Abt. 129, 29th Panzergrenadier Regiment, Sicily 1943 (sand with green overspray, no reg number). A “number jungle” sheet plus targeted decals are provided by Cartograf. However, note that all five vehicles are shown without either the standoff armor or the spare tire. Also, due to CE requirements the twin “SS” runes are provided for the registration plates as two minuscule separate halves to be assembled on the plate decal. Overall this adds to the DML stable of early war armored cars.